Our course is approved by the Michigan Bureau of Construction Codes, Plumbing Division to help you satisfy your continuing education requirement and renew your license. 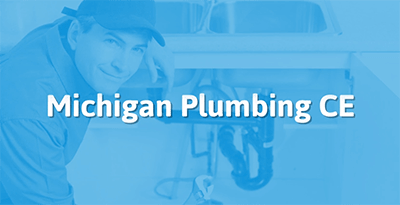 Take the continuing education to renew your MI plumbers license today. All of our courses can be completed At Your Pace Online to help you meet the state's requirements to maintain your license. Once you finish your class you will have an official certificate of completion to save for your records. Plumbers in the State of Michigan are required to renew their licenses by April 30th. Journeyman and Master licenses expire every 3 years. The licensee must also have completed a 5-hour approved code update course within one year of the adoption of a new edition of the Michigan Plumbing Code. and the many other changes that professionals like you need to know!